The route goes along the central face, between the right and the left Rhombs. First 2 pitches coincide with The left and The right Rhomb а ms (up to R0). Then there is a fork, and the routes diverge, "Between the rhombs" goes upwards by the slab. It is impossible to get lost on the route: bolts show the way. Distances between the belays are from 2 to 5 meters . 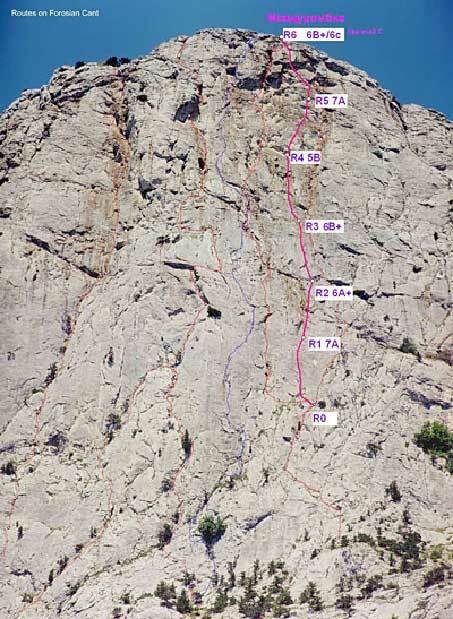 The only place where, the distance is big is in the end of the second pitch (R1-R2), but there is an ideal crack (20 - 40 mm ), where one can place his belay device, but it is possible to go without it, if you are sure ( 10 m, 6 А ). The last two pitches are very interesting, but climb accurately, the rocks are mossy. The route "Between the rhombs" is all free climbable. No pins, sky hooks and kopperheds. To send the route without all this stuff means a lot of pleasure! The route was being made top-down from summer till autumn 2002. In May 2003 it was sent by free climbing in 3 hours by the team Sava (Igor Savelyev, Dnepropetrovsk) - Terrorist (Sergey Nadtochiy, Simferopol).